Nine days ago, we left Vermont for visits with cousins and friends in Upstate New York and Ohio. Along the way, we’ve seen wonderful sites and met some great people. Surprise at the sight architectural marvels is rare in this age of digital photography. Fallingwater, the Frank Lloyd Wright masterpiece, is an exception. The dozens or hundreds of pictures I’ve seen of it did not lessen my wonder. Start with Fallingwater’s location: Mill Run, Pennsylvania, in the Laurel Highlands, the steep but rounded western foothills of the Allegheny Mountains in the northern Appalachians. The falling water comes actually from Bear Run, not Mill Run. In the band of states first settled by the Scots Irish – Maryland, Pennsylvania, West Virginia and Ohio – streams are often called ‘runs’, a shortening of the archaic English word, ‘runnel’. Runs cut through orderly, flat strata very different from the tortured strata in New England. The glaciers didn’t reach here, so surface rock – large and small – is far less than stoney New Hampshire. No matter how often I’d heard Wright’s invocation of the ‘organic’ in his architecture, until I saw Fallingwater the concept hadn’t clicked. Even a day at Taliesin East hadn’t brought home the message. But seeing his interpretation of the landscape in which I grew up did. The exterior stonework echoes, but doesn’t imitate, the strata above the house from which it came. Inside, the floors look like cross-sections of a stratum. In one gallery, Wright incorporated a ledge in the building as living fountain. Bear Run flows under Fallingwater. 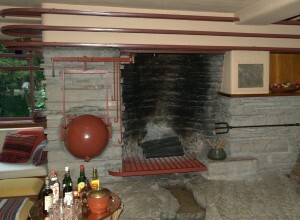 In it Wright built a swimming pool below the livingroom. At the guest house above the main house he built another pool filled with the Run’s green-brown water. What I’ve read on Fallingwater holds many references to modernism and to the heavy Japanese influence on the interior. Our guide cited the low ceilings and small rooms. But they reflect another homage. They acknowledge the vernacular architecture of the Scots Irish band of the Appalachians. That thought occurred to me when we stopped for dinner in Scenery Hill, Pennsylvania, about an hour west by northwest of Fallingwater on US Route 40, the National Road. 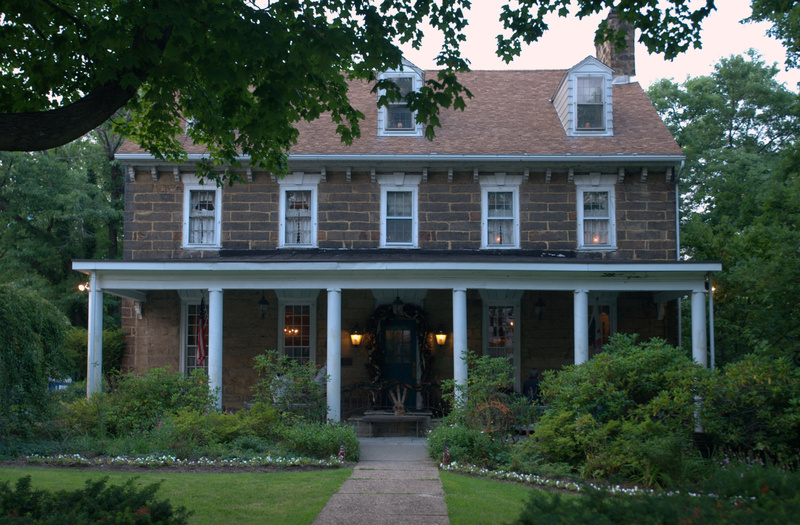 If you have any reason to be within 100 miles of the Century Inn in Scenery Hill and you have any interest in historic architecture, antiques, antiquities, excellent food and the like, make the trip. You’ll remember both the journey and the destination. The Century Inn’s stone structure dates to 1794, 140 years before Fallingwater (1937). Its intimate, low-ceilinged rooms put me in mind of Wright’s rooms in their dimensions, in their very human scale. In every other way, it is Fallingwater’s antithesis. The Scots Irish preferred to build on ridges or where they had clear lines of sight for a good distance. Coming as they did from ‘the bloody borders’ of England and Scotland via Northern Ireland, their preference was practical. Scenery Hill strings along a hill crest from which pastures slope into narrow junctures. Fallingwater sits where no Scots Irish would have built: in a narrow defile deep among trees that were mature 75 years ago. Although it seems light and well lit, the meter on my camera on a sunny afternoon insisted the ravine was quite dark. The shape of the Century Inn suggests its builders origins. In the US, the same design appears in wood, brick and stone wherever people say ‘run’ instead of ‘stream’. 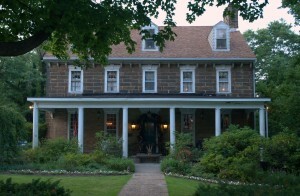 The stonework on the Inn is much later than the original construction. Its uniform shape in no way recalls the strata on which it sits. To the contrary. Its three stories, dormered roof line and civilised porches emphasise its owners triumph over nature. But, of course, so does Fallingwater.